“The Hurt Locker” is framed by an opening quote, "The rush of battle is a potent and often lethal addiction, for war is a drug." This is the worst part of the movie - this quote. War is much worse than a drug and much more complicated. I'm sure that the book that this quote comes from is a wonderfully complicated book. But here, framing this entire movie, it is too simple. This quote would have been great in front of “Apocalypse Now” because clearly there are a lot of different kinds of drugs going on there (including a great deal of confusion-inducing non-addictive ones) so there it would have been a wide open statement, or in front of “Tin Cup” because that movie stars Kevin Costner and is about a golf war. But apart from the pleasure-drug thumping soundtrack of “The Hurt Locker”, this movie shows a complexity of human action way beyond the movements of cocaine. Apart from this, it is a really good movie. Instead of high realism, it is like a storybook story about a person who lives some of the time in an astronaut-like bomb suit in the Iraq and some of the time with a grocery cart in a suburban neighborhood somewhere in America. 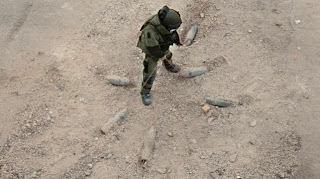 The person in the bomb suit, James, is not like the other bomb-defusers. The other bomb-defusers are more like bomb-detonators. Instead of advancing themselves, they advance a robot that can detonate a bomb with a controlled explosion while they stay at a safe distance. These bomb-detonators approach the bomb only if all else fails. The bad side of detonation is that the buildings and streets get blow up. But our man James is on the ground - with all the bad things that being on the ground entails. He walks up to ticking bombs with a peculiar comfort and manually defuses the bombs with his bare hands. We see the great pleasure and rewards of being a master at a difficult skill. All this to the horror of his team who think of James as having a death wish that will bring them all closer to death. Some people seem to have bodies that automatically react to or are drawn towards explosive situations. Rather than the idea of a noble or heroic brain in action, I think sometimes it can be more like an involuntary movement of one’s body. They jump into pools when they see a kid struggling before they notice that they still have a cigarette in their mouth, they put their bodies between people in a fight before their mind questions if this is a useful idea for anyone, they sometimes walk instinctively towards a ticking bomb. I think it is fair to say that people like this would probably find it more painful to hear about bomb explosions from the safety of their homes, over the radio, than to be physically present where the trouble is and allow their bodies to walk forward and react. The smartest part of this movie is that it is made very clear that James struggles to understand why he is the way he is, why his body moves so effortlessly towards these deadly bombs. It is too bad that that quote understands – everything else about the movie suggests something much more complicated. Mainly what James knows for sure is that he is really good at defusing bombs and that there are a lot of bombs around him. The hope that one is "doing good" with their actions can sometimes make for deeper trouble than the trouble made by thrills and testosterone - the uncynical belief that one is making the world a better place, that one is saving children, stopping fights, defusing bombs. I think it is one of the great contemporary fantasies of war - soldiers as bomb-defusers. We know really well the horribly intentioned war villains, but we don’t as often see the good intentions gone horribly wrong. Here, we see James’ good intentioned initiatives, his masterful abilities and his dangerous mistakes and we get to focus on these things in a clear and strangely gentle way. But my favourite part of the movie came when our man’s bomb squad almost crosses friendly fire in the desert with an ambiguously dressed group of soldiers. As the camera gets closer (and the situation defuses), we noticed that the head soldier of this group is the movie star Ralph Fiennes. As he says hello to our man in his British accent, I assume that he is playing himself as a British movie star among a crew shooting a war movie inside a war movie. And I was, like, Yeah! Let’s go war-movie-reality-tv-realism-reversal! But it turned out they were just playing British soldiers. One of the best films I have ever seen. outstanding story and so real. kathryn biglow couldn't be a ordinary creator..on watching this film a bit of adventure screened in front of me that how W.James could defuse the bomb.The perception and casting of each role was unique and meaningful..I fond to remember the scene that W.James pretend to feel grimmed when he defuse a body-implanted explosive from a young boy whom he thought to be "the beckham" once he played with him..
You're an idiot with lots of YMCA participation trophies.